The South Dublin Community Platform are carrying out a training programme for community organisations is working to address poverty and social inclusion in South Dublin County, and to familiarise these with Ireland’s human rights and equality commitments. The aim is that, following this training, organisations can then employ this knowledge in their work at local/community level to make the state and others accountable. This will see five regional workshops organised for Citizen Information Centres on the topic of Equality Law and the new Workplace Relations Commission. The point of the workshops is to equip front line staff with knowledge in employment and equality law so they can better advise members of the public. Older Voices Kildare is providing an education programme on human rights and equality, delivered to older people from a range of marginalised groups, provided at three locations throughout Kildare. Involving partners North Dublin City GP Training and Cairde, Crosscare Migrant Project aim to develop information resources and training programme for GPs, in order to address the right to health care for vulnerable migrants and developing a culturally competent practice. This programme is to train approximately 20 mental health service users and carers as Peer Research Assistants. The aim is that these Peer Research Assistants will be involved in the Mental Health Reform National Consultation 2016-2017 and future research projects. This project will see Headway design and deliver an advocacy and human rights training programme aimed at meeting the needs of Headway service users with Acquired Brain Injuries (ABIs). The programme will train approximately 30 service users across three locations: Cork, Limerick and Dublin. Partnering with the Public Interest Law Alliance (PILA), BTAP will provide education and training on equality and human rights frameworks to Travellers living in Labre Park, Ballyfermot. The aim is to equip participants to challenge the inequalities, discrimination and racism faced by their community, with a particular focus on the need to redevelop Labre Park to provide safe and culturally appropriate accommodation. With this project, Sonas will provide information on domestic violence orders to non-English speaking women by translating an existing domestic violence order information pack into various languages, including Polish, Russian, French, Urdu and Arabic. This grant will support Pieta House in their initial development of an Irish Network of Traveller Mental Health, including the setting up of a steering group and the development of a survey model for future research on Traveller mental health. Involving partner Longford County Council, this initiative by Longford Community Resources Ltd. aims to provide a programme of training and development to public bodies and publicly funded organisations in Longford to assist them in understanding and committing to human rights and equality, particularly in relation to the public sector duty. Working with Educate Together and GLEN, School of Communications and Insight Centre for Data Analytics, DCU aims to develop a prototype online student survey tool to measure equality and inclusivity in primary and/or post-primary schools along the lines of gender, ethnicity, sexual orientation, religion, class, physical appearance and disability. Partnering with NUIG Centre for Housing Law, Rights and Policy and Ballymun Community Law Centre Ltd., CAN aims to provide a training and development project to support local authority tenants participating within the Collective Complaint FIDH V Ireland (housing rights case) and in their engagement with duty bearers in relation to the development and implementation of solutions to issues identified. This project will see the Department of Geography, NUIM carry out research to conduct a comprehensive human rights and equality audit and review of migrant integration policy across public bodies in Ireland, and to examine how policy may be reshaped if necessary in the future to better meet integration needs. This project will see NWCI carry out research, resource development and training to promote the implementation of gender budgeting. The intention is to develop a clear roadmap by which gender budgeting may be successfully implemented in Ireland. Partnering with Pavee Point Traveller and Roma Centre, Centre for Human Rights and Citizenship Education will conduct a research and training project for teachers on creating a culture of inclusion and equality in their classrooms, with a particular focus on Traveller children. Training in part will be delivered by six Traveller facilitators who will be trained as part of the project and good practice guidelines will be developed and published. With the involvement of a working group of experts through experience, Inclusion Ireland will develop good-practice guidelines for service providers’ Equality & Rights Committees, and provide training to members of such committees. The guidelines will ultimately be submitted for endorsement to Irish Human Rights and Equality Commission, HIQA and the HSE. This project will see research, policy development and a public awareness campaign carried out by the IPRT to promote the abolition of the use of solitary confinement in Ireland. This would reflect recent recommendations by both the UN Special Rapporteur on Torture and the Council of Europe to abolish prolonged solitary confinement and to permit ‘separation’ only in very exceptional cases respectively. With this project, TENI aims to develop and deliver research and a training programme on Trans Inclusion in the Workplace, which will promote the human rights and equality of trans people. Good practice guidelines will be developed as part of this and published. This project will support the Department of Politics and Public Administration, UL in the publication of national report into the participation of Travellers in Local Traveller Accommodation Consultative Committees and its impact on the provision of Traveller specific and culturally appropriate accommodation, and dissemination of the report’s findings. This is being conducted with partner organisation the Irish Traveller Movement. With this project, the Sutherland School of Law, UCD aims to develop and deliver a training workshop on human rights for teachers who are interested in delivering the optional Leaving Certificate subject ‘Politics and Society’, and produce a report from the workshop on ways to further develop Human Rights Education within the post-primary curriculum. This project will see a Collaborative Arts and Interculturalism seminar hosted by Create, bringing together artists, key activists, civil society and policy makers to explore common themes, share experiences and discuss how arts and cultural practices can work to create enable and celebrate cultural diversity. The ICCL will organise a high level event on ‘Making Socio Economic Rights Real’, which aims to enhance and promote the understanding and advancement of Economic, Social and Cultural rights (ESC) among politicians, law and policy makers, civil society and relevant stakeholders. Economic, Social and Cultural Rights Initiative are partners in this project. This grant will support Age Action Ireland in the publication of research on the State Pension Gender Gap and the dissemination of its findings through the publication of a policy brief and organisation of seminar. In association with the Education Disadvantage Centre, St. Patrick’s College, this project will see a conference on Education Equality for Travellers organised by Pavee Point Traveller and Roma Centre, with the aim to examine current priorities ten years after the publication of the Report and Recommendations for a Traveller Education Strategy. South Dublin Community Platform N/A Training programme for community organisations working to address poverty and social inclusion in South Dublin County, to familiarise them with Ireland's human rights and equality commitments. The aim is that the organisations can then employ this knowledge in their work at local/community level to make the state and others accountable. Citizens Information Service, Offaly N/A Organise five regional workshops for CIC's on the topic of Equality Law and the new Workplace Relations Commission. The point of the workshops is to equip front line staff with knowledge in employment and equality law so they can better advise members of the public who come to them for advice. Older Voices Kildare N/A Education programme on human rights and equality delivered to older people from a range of marginalised groups, to be delivered at three locations in Kildare. Crosscare Migrant Project North Dublin City GP Training; Cairde. Develop information resources and training programme for GPs, to address the right to health care for vulnerable migrants and developing a culturally competent practice. Mental Health Reform N/A Programme to train approximately 20 mental health service users and carers as Peer Research Assistants. The aim is that these peer research assistants will be involved in the MHR National Consultation 2016-2017 and future research projects. Headway, Cork N/A Design and deliver an advocacy and human rights training programme aimed at meeting the needs of Headway service users with Acquired Brain Injuries (ABIs). The programme will train approximately 30 service users across three locations, Cork, Limerick and Dublin. Ballyfermot Travellers Action Project (BTAP) Public Interest Law Alliance (PILA) Education and training on equality and human rights frameworks for Travellers living in Labre Park, Ballyfermot. The aim is to equip participants to challenge the inequalities, discrimination and racism faced by their community, with a particular focus on the need to redevelop Labre Part to provide safe and culturally appropriate accommodation. Sonas Domestic Violence Charity N/A Provide information on domestic violence orders to women from non-English speaking backgrounds by translating an existing domestic violence order information pack into various languages, including Polish, Russian, French, Urdu and Arabic . Pieta House N/A Support the initial development of an Irish Network of Traveller Mental Health, including the setting up of a steering group and the development of a survey model for future research on Traveller mental health. Longford Community Resources Ltd Longford County Council Programme of training and development among public bodies and publicly funded organisations in Longford to assist them in understanding and committing to human rights and equality, particularly in relation to the public sector duty. School of Communications and Insight Centre for Data Analytics, DCU Educate Together; GLEN (Gay+Lesbian Equality Network) Develop a prototype online student survey tool to measure equality and inclusivity in primary and/or post-primary schools along the lines of gender, ethnicity, sexual orientation, religion, class, physical appearance and disability. Community Action Network NUIG Centre for Housing Law, Rights and Policy; Ballymun Community Law Centre Ltd. Training and development project to support local authority tenants participation within the Collective Complaint FIDH V Ireland (housing rights) and their engagement with Duty Bearers in relation to the development and implementation of solutions to issues identified. Dept of Geography, NUIM N/A Research to conduct a comprehensive human rights and equality audit and review of migrant integration policy across public bodies in Ireland, and to examine how policy may be reshaped if necessary in the future to better meet integration needs. National Women’s Council of Ireland N/A Research, resource development and training project to promote the implementation of gender budgeting. 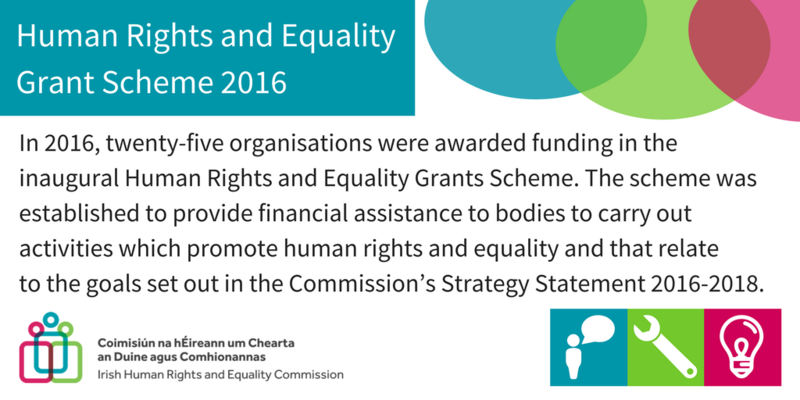 The intention is to develop a clear roadmap by which gender budgeting may be successfully implemented in Ireland. Irish Congress of Trade Unions (ICTU) Free Legal Advice Centres (FLAC) Develop a guide for trade unionists on how to take equality cases in light of the new WRC arrangements and develop and pilot a training course on its application. Centre for Human Rights and Citizenship Education, DCU Pavee Point Traveller and Roma Centre Research and training project for teachers, on creating a culture of inclusion and equality in their classrooms, with a particular focus on Traveller children. Training in part will be delivered by six Traveller facilitators who will be trained as part of the project and good practice guidelines will be developed and published. Inclusion Ireland N/A With the involvement of a working group of experts through experience, develop good-practice guidelines for service providers 'Equality & Rights Committees' and provide training to members of such committees. The guidelines will ultimately be submitted for endorsement to IHREC, HIQA and the HSE. Irish Penal Reform Trust N/A Research, policy development and public awareness campaign to promote the abolition of the use of solitary confinement in Ireland. This would reflect recent recommendations by both the UN Special Rapporteur on Torture and the Council of Europe to abolish prolonged solitary confinement and to permit 'separation' only in very exceptional cases respectively. Transgender Equality Network Ireland (TENI) N/A Develop and deliver of research and training programme on Trans Inclusion in the Workplace , which will promote the human rights and equality of trans people. Good practice guidelines will be developed and published. Dept of Politics and Public Admin, UL Irish Traveller Movement Support publication of national report into the participation of Travellers in Local Traveller Accommodation Consultative Committees and its impact on the provision of Traveller specific and culturally appropriate accommodation, and dissemination of the reports findings. Sutherland School of Law, UCD N/A Develop and deliver a training workshop on human rights for teachers who are interested in delivering the optional Leaving Certificate subject 'Politics and Society', and produce a report from the workshop on ways to further develop HRE within the post-primary curriculum. Create N/A Organise a Collaborative Arts and Interculturalism seminar bringing together artists, key activists, civil society, policy makers to explore common themes, share experience and discuss how arts and cultural practices can work to create enable and celebrate cultural diversity. Irish Council for Civil Liberties Economic, Social and Cultural Rights Initiative Organise a high level event on 'Making Socio Economic Rights Real', which aims to enhance and promote the understanding and advancement of Economic, Social and Cultural rights (ESC) among politicians, law and policy makers, civil society and relevant stakeholders. Age Action Ireland CLG N/A Support the publication of research on the State Pension Gender Gap and the dissemination of its findings through the publication of a policy brief and organisation of seminar.